Although this cluster of flowers looks lovely as is, I decided to shoot it in black and white to evoke a dreamy, surreal mood. Linking up with my friend, Verena today! Ein Foto, wie aus einer anderen Zeit. Wunderschön. Stunning, I can't get enough of gorgeous flower photo's! Einfach nur traumhaft, liebe Duni! Very dreamy indeed, I love black and white photography. Such a simple and elegant shot. Love it! Gorgeous! Love the black and white. 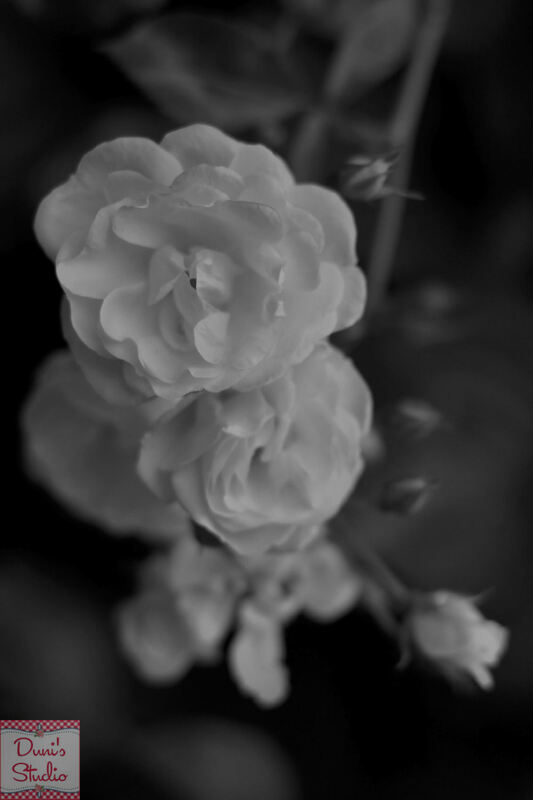 I would have never thought to shoot flowers in black and white -- but your photo is lovely!! And that's definitely what it is! Lovely Duni! even black and white roses looks so sweet and elegant! my favorite are - Knockout! Schwarz-Weiß-Aufnahmen sind doch immer schön! Sicherlich ist dies eine Rose aus Deinem Garten, oder? one word to describe your photo : dramatic!